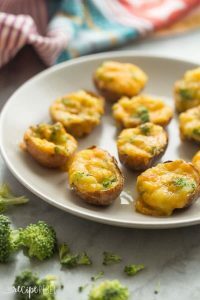 These Broccoli Cheddar Twice Baked Potatoes are bite-sized and make the perfect easy holiday appetizer! Plus, they’re easy to make ahead! So, I’m just gonna come right out and say it: I don’t love broccoli. I know I’ve mentioned that before because, well, there’s this here Layered Broccoli Salad (which my husband deemed the best so I had to share! ), but I just feel like I have to be completely honest with you. And although my veggie-resistant self sees broccoli as the lowest of the low, my husband tells me it is actually quite enjoyable, and my 4 year old loves broccoli. Whenever we’re grocery shopping I ask her what kinds of veggies she wants to snack on for the week and broccoli is always at the top of the list! Next are carrots, tomatoes and, way down the line, cucumbers. See, I know that broccoli and cheddar are just one of those awesome combinations, (I mean, cheddar with just about anything, right?! ), so I was confident these would be a hit here, especially with the kids! And I was right. The girls loved these, the husband loved these, and I love that I’m packing in 2 healthy veggies plus a good dose of calcium and a bit of protein into each little bite. 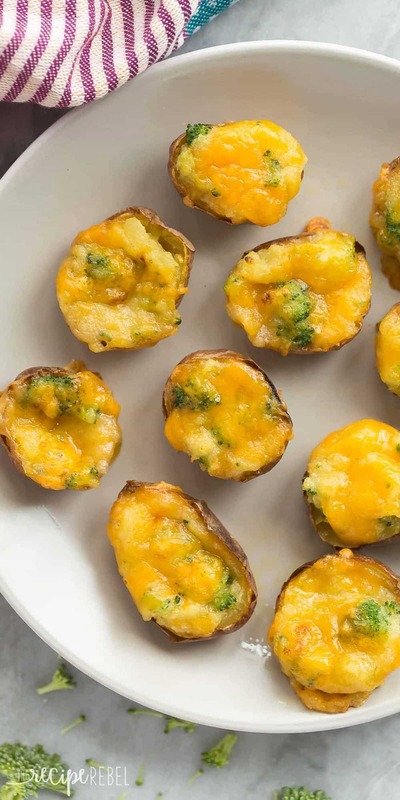 Another thing to love about these little twice baked potatoes? They are such a great make ahead appetizer or side dish! You can prep them all the way til the last bake, then just cover them up and keep in the fridge for a while, before baking them when you need them. There’s nothing this mama loves more than being able to prep a dish completely when I can find 5 or 10 minutes without a child on each leg. 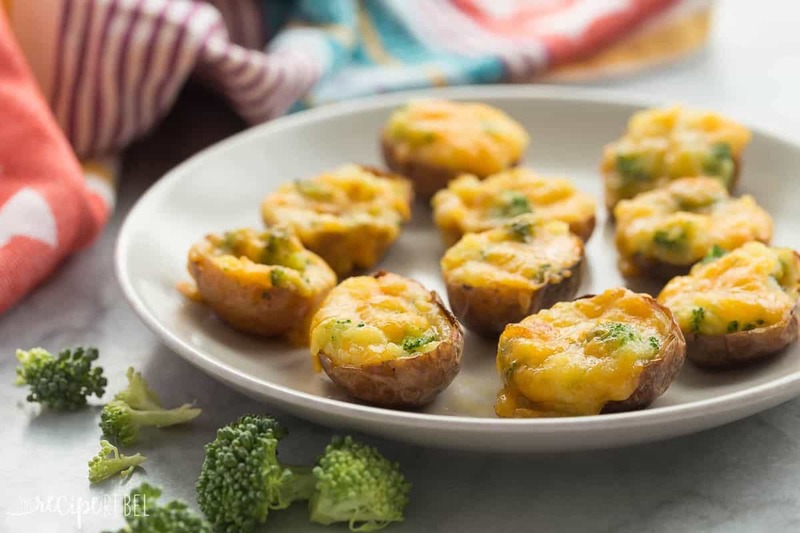 I made these twice baked potatoes with some Blushing Belles from The Little Potato Company, but really any of the Little Potatoes would work well — I just think the red skin is so pretty! The Terrific Trio would be another great way to add a fun pop of color to your holiday platter. These are perfect for a make ahead appetizer or side dish for the holidays! As I mentioned above, you can make do all the prep right up until the last bake, then just cover and refrigerate up to 24 hours before baking them the second time and serving to guests. I used cream, because I had some extra in the fridge, but you can use milk or whatever you have on hand! Buttermilk would also work, or sour cream. To steam broccoli quickly, place finely chopped broccoli in a microwave safe container (I use one with the little vent that pops open), and add 2-3 tablespoons of water. Put the lid on but pop the top, and cook on high for 1 minute. I didn’t have to drain any water — the broccoli had absorbed it or the steam escaped right through the vent. *This post is sponsored by The Little Potato Company as part of my ambassadorship with them. Thank you for supporting brands that help me bring you more creamy, cheesy recipes! 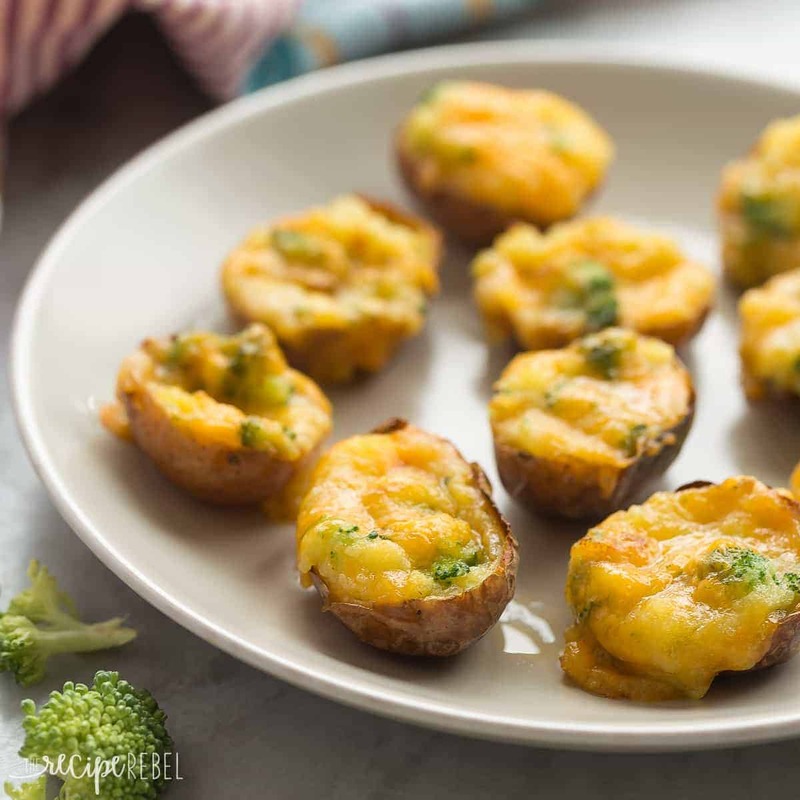 These Broccoli Cheddar Twice Baked Potatoes are bite-sized and make the perfect easy holiday appetizer! Plus, they're easy to make ahead! Place potatoes on a baking sheet and bake at 400 degrees F for 30 minutes or until tender. Cool until you're able to handle them (I place mine in the fridge to speed this up!). Slice potatoes lengthwise and scoop out the flesh with a teaspoon, being careful to leave enough of the sides intact so that they are sturdy enough to fill. Mash potato flesh with a fork. Add milk, salt and garlic powder and mash until smooth. Stir in broccoli and ½ cup cheddar. Spoon into potato shells and press down gently to fill. Sprinkle with remaining ¼ cup cheese and bake at 400 degrees F for 10 minutes, until heated through and cheese has started to brown. Serve immediately. Place potatoes on a baking sheet and bake at 400 degrees F for 30 minutes or until tender. Cool until you’re able to handle them (I place mine in the fridge to speed this up!). Stir in broccoli and 1/2 cup cheddar. Spoon into potato shells and press down gently to fill. Sprinkle with remaining 1/4 cup cheese and bake at 400 degrees F for 10 minutes, until heated through and cheese has started to brown. Serve immediately. Thanks Sabrina! I hope they enjoy! I love mashed potatoes with garlic! This is a perfect snack for football season and a great side dish to bring to casual get-togethers. Every one in our family loves scalloped potatoes with extra cheese, please. Mashed potatoes are a favourite in our house! Don’t forget the gravy! Scalloped Potatoes are my favourite for the holidays! I love mashed potatoes. This is great. WE DON’T HAVE NONE OF THEM WE HAVE POTATO SALAD AND SWEET POTATO CASSEROLE.